Good Morning!! It's a beautiful HOT day here in TEXAS!! So HOT, you just want to move at a "snail's pace" so you don't overheat! That's definitely what I've been doing lately! We just got back into our house after having to leave for 2 days and stay at a hotel due to our air conditioning going out! It was 91 degrees inside and yes, that WAS cooler than outside, but we are babies and can't stand to go to bed hot!! So Audrie, our youngest asked if we were going to California (huh?) and I told her, yes, HOTEL CALIFORNIA! So according to her, we have lived at Hotel California for the last 2 days and she was super happy to tell everyone she came in contact with all about it! (Too bad for Eric and I there weren't mirrors on the ceiling and pink champagne on ice--teehee!) OK--I know!!--TMI!! On to the card for today's Jen's Sketch For You To Try, as I'm trying to make this short and sweet. Jen and I are headed to Mineral Wells this morning (at a snail's pace--supposed to reach 107 degrees there) to go to a scrapbook store--Cat's Creations. It's actually about an hour west of Fort Worth, but there are NO other scrapbook/papercrafting stores in the entire Dallas/Fort Worth metroplex (ok, there's a TINY one in McKinney, but this one has way more selection!) --makes me so mad! So if you're not doing anything, especially if you are a North Texas girl, come see us! We should be there from about 10-12 this morning and then will be going to lunch or getting a pedicure. I'm not sure which one! Hey, did you know that Storage Units Ink and More just released 6 more stamp sets? This one is called (you guessed it) At a Snail's Pace and it contains lots of cute snail images and sentiments. I colored her (while we were at Hotel California) with my Prismacolor Pencils and OMS, and then just cut her out with my CM Circle Cutter. I used all Core'dinations cardstock with the exception of the DP and the Papertrey White (love that stuff!). Be sure and go to the SUINK website and check out all the other new sets! They are all so fun!! This was a really cool sketch and I hope you get a chance to play with it. If you do, be sure and use keyword SFYTT, so we can find your creations more easily. Want more inspiration for the sketch? Go (faster than a snail's pace--you don't have all day!) and check out Shannan, Amy S. and Amy R.'s blogs. Also, Jen has a new Guest Designer for the month: Bonnie Sharp (The Lucky Clucker). Carole is on vacation, getting in touch with nature, so she will be back next week, and will have hopefully not picked up any ticks from the outback. Ope! I mean Ozarks. TIP: Color images in unusual color combos (not as found in nature). It's ok to be creative in that area. Otherwise all snail cards would be an ugly shade of slime. Hi Susie, I'm Jerri Kay, I just had to come over and check out your card after reading Carole's blog and am so happy that I did. This card is so adorable and I love your color choices. I have just recently found your and Jens blog. I didn't know that you guys are here in Texas. I am from Mckinney.Good to now about the store in Mineral Wells. I do shop at the one in Mckinney the girls there are super friendly but they don't have alot of product. Have a great day shopping. I don't think your daughter would have had as much fun had there been the extra goodies..LOL!!! She would have been "running for the door, trying to find the passage back to the place she was before"!!!! Oh, I got so wrapped up in singing the song I forgot. Your card ROCKS!!! This is adorable, Sus! Hope you guys have fun! 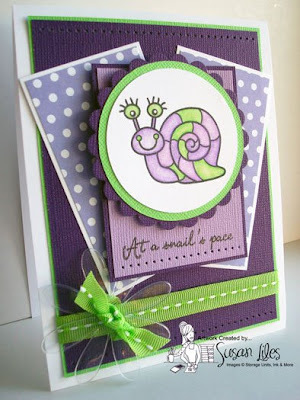 I am luvin' that purple and green snail! Fabulous card! OMG!!! This is soooo ka-ute! Love the snail!! Love the purples! Great card! Awww... this is such a cutie! I love this card! This is so adorable!! I love the colors!! Your snail in the round is absolutely adorable! Love the colors, the textured paper and clear flower is *just right*! Love this one, especially the colors! TFS! OMG, could the snail be any cuter?? Love him!! Great colors too. ...sorry to hear about your air conditioner. 90 degrees inside?? Yikes!! I love this darling little snail, Susan! Great job with Jen's sketch!